After four years and five months, I have decided to upgrade my 128GB LTE iPad Air. Thank you, educators and students! So, I'm getting the sixth-generation iPad, Wi-Fi-only, with 128 GB of storage for $429. I ordered it today (March 28) from Best Buy to take advantage of the $25 Best Buy gift card to offset the cost of an Apple Pencil. So, why am I taking the plunge now? I take more notes now than I ever have. Maybe even more than I did in college. I have been using my iPad to take notes and sometimes I use a stylus. 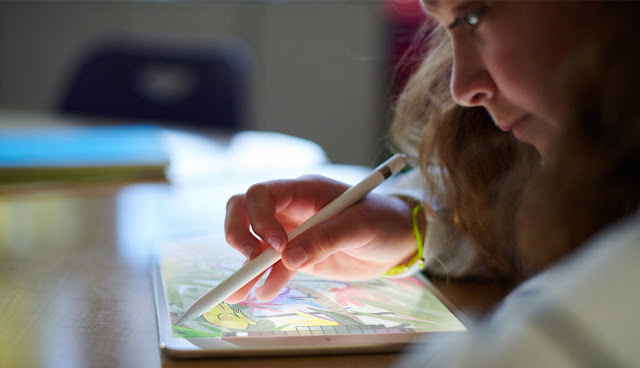 But, it isn't the same as using the Apple Pencil. This feature alone put it over the top for me. Touch ID didn't come out until the iPad Air 2 in October 2014. So, I missed it by about a year. I've already had two generations of iPhones with Touch ID, so it will be nice to finally have an iPad I don't have to constantly type in a passcode. I also use Apple Pay fairly regularly and it will be nice to have that capability on my iPad as well. My iPad Air has a 64-bit A7 processor with an M7 motion co-processor. The A7 is a 1.4 GHz dual-core chip with 1 GB of RAM. The 2018 iPad is light years ahead. It has an A10 Fusion chip (but not quite the A10X Fusion in the iPads Pro) with an M10 motion co-processor. The A10 is a 2.34 GHz quad-core chip with 2GB of RAM. iMore's Geekbench 4 benchmarks put the 2018 iPad with a 3254 single-core rating and 5857 multi-core rating. Using Geekbench 3 on the iPad Air, it got a 1454 single-core rating with a 2586 multi-core rating. While I probably won't use the iPad for many photos or videos, it's nice to have an upgraded rear camera. The iPad Air has a paltry 5.0 MP iSight camera. The 2018 iPad at least has an 8.0 MP iSight camera. They both can do 1080p video recording. They also both have a horrible 1.2 MP front-facing camera. But, I won't do selfies or FaceTime with the iPad. 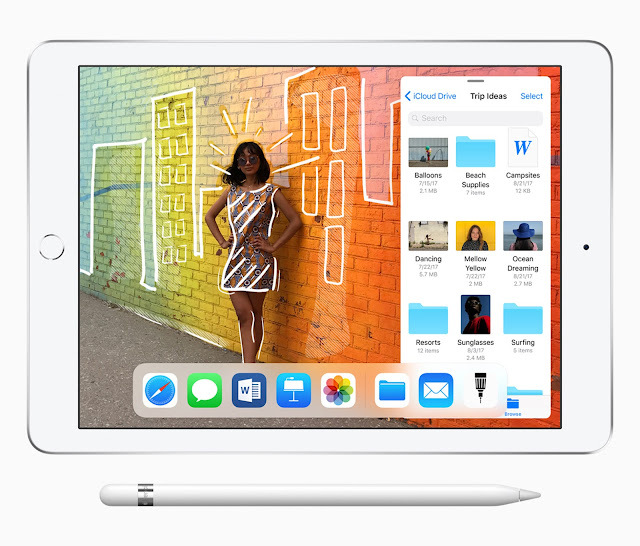 Last fall, I decided to kill the iPad's data plan and figured out a workflow for my tablet. So, I'm saving $130 and the money I would've paid in a monthly data plan. I also want a lighter tablet since I take it around with me all the time. I can live without a fully laminated display with antireflective coating and powered by ProMotion technology, a P3 wide color display and True Tone technology. I can also live without the Smart Connector, the 12.0 MP rear camera with optical image stabilization and quad-LED True Tone flash as well as 4K video recording, slo-mo support for 1080p at 120 fps, and continuous autofocus during video recordings. Don't need a 7.0 MP front-facing camera as well as four speakers. While the second-generation Touch ID would have been nice, just to have Touch ID on my iPad is good enough. For those who have the iPad Air 2, 9.7" iPad Pro, 10.5" iPad Pro, or 12.9" iPad Pro, you would probably NOT want the 2018 iPad. But, for me, it's an upgrade that's long overdue.